Thinking About Food: Summer tastes in winter! At the end of summer I visited a few of the local berry farms to stock up on frozen berries. They were lovely quality and very well priced and it is great to have them as a fallback for some colour and variety when the winter feels like it is dragging on. My daughter especially loves them with icecream for dessert and I figure that although one probably cancels the other out at least she is getting something good into her! 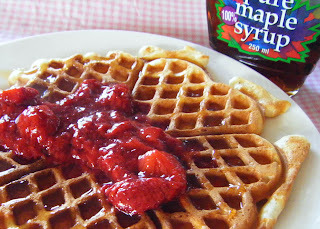 I recently had my nephews to stay so we hauled out the waffle maker and the maple syrup, then popped some frozen strawberries into a bowl with some vanilla sugar and gave them a good burst in the microwave. They turned into 'melted' strawberries (as my daughter has coined them), not quite a syrup, but not quite a conserve either! They were delicious with the crispy waffles and provided something a little more special for breakfast. For the waffle recipe I used one from The Best of Annabel Langbein: Great Food For Busy Lives (revised and expanded edition) which I have just bought and have started a list of all the lovely things in it I would like to make! Beat together milk, salt and egg yolks, mix flour and baking powder. Once combined, add the melted butter and beat until smooth. Leave to stand about 2 hours. Beat egg whites until stiff then fold into mix. 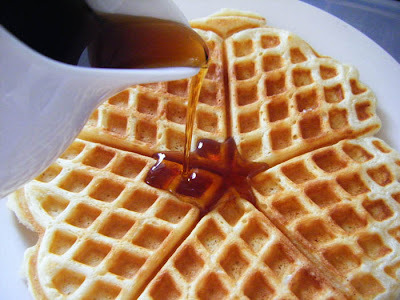 Pour about 3/4 c of mix onto hot buttered waffle iron and close. Cook until golden brown. Makes 8-10 waffles. Your waffles look fabulous. Do you use your waffle iron much? I've not got one and wonder if it's worth having one? I've never made waffles in my life, but think I'd like to. I do use my waffle maker a bit, it is nice for something different, the kids love pancakes but they think these are more fun! Plus my 12 year old will happily stand over the waffle machine making them because of the 'novelty' value IYKWIM! 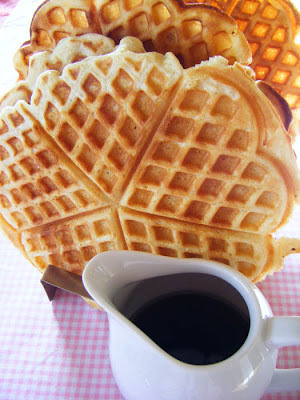 I have another recipe on here for overnight yeast waffles which are really good too! I only mentioned you in a blog a little while ago and then Gail said you had started blogging! Great to see you around the 'traps'!!! Thank you Linda for the recipe and the link to the *counter*. Nod, nod, wink ,wink. No what I mean! Your pretty heart shaped waffles look wonderful! Linda I want to come to your house for breakfast! Those waffles are so cute.